I picked up the mason jar with the compost in the bottom* and was about to toss it to the worms when I saw a little flash of green. A seedling! A tiny little seedling, in its little seedling stage with two little seed leaves held up on the thinnest of stems, already leaning toward the light from the nearby window. I paused to study it, to see if I could determine what it was to become. Of course, it will be a plant. But what kind? A weed? Or perhaps a more desirable plant? Perhaps a petunia? One that is a color never seen before! Or maybe it is a lettuce seedling? One that could offer me freshness in the midst of winter! Almost instinctively, I added water. I moved it to a better window where it would get more sun. I took a picture of it so I could remember its humble beginnings. I bought this rather large terrarium several years ago, in the winter-time, when it was too cold to find plants to plant in it, so I decided to wait until spring. Spring came, and soon I was busy outside and had no time to plant my new terrarium. Summer and fall passed and once again, when I had the urge to get some plants to put in it, it was winter time, the wrong time of year to have houseplants shipped. I promised myself I would get to it in the spring. Spring came, and soon I was busy outside and had no time to plant my year old terrarium. Summer and fall passed and once again, when I had the urge to get some plants to put in it, it was winter time, the wrong time of year to have houseplants shipped. I promised myself I would get to it in the spring. Spring came, and soon I was busy outside and had no time to plant my two year old terrarium. Summer and fall passed and once again, I had the urge to get some plants to put in it, and it was winter-time, the wrong time of year to have houseplants shipped. Repeat for about two more years and we arrive at today. Once again, I’ve decided I want to plant something in that terrarium, and it is nearly winter-time, the wrong time of year to have houseplants shipped. I think I need help. Dr. Hortfreud? Hortense Hoelove? Readers? 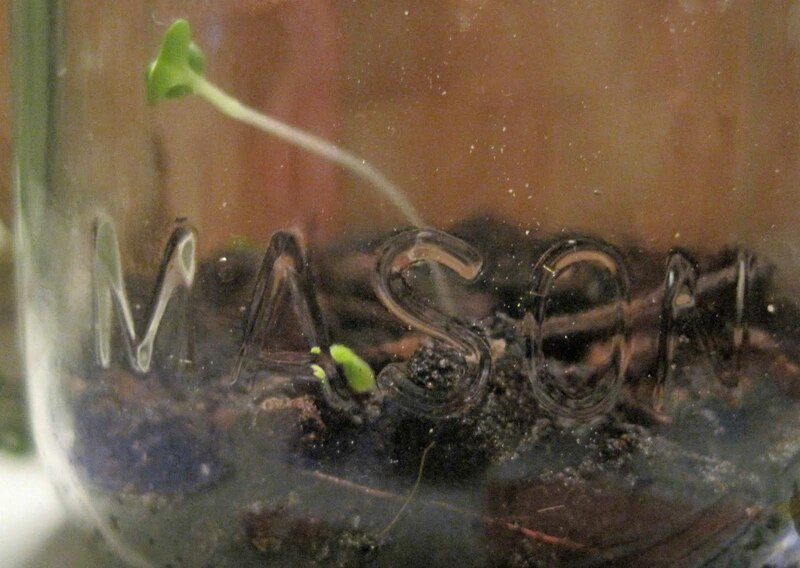 *Why did I have compost in a mason jar. To take a picture of it, of course. Now this really brought a chuckle to my heart. The accidental terrarium! That's a really pretty one you are waiting to plant up. My big terrarium has rocks and a big knot hole from a tree in it right now. Ha...The light makes a good night light so guests don't fall down in the hallway when they make their way to the kitchen or bathroom. tee hee...Wonder what DR Hort would make of that. When I lived in an apartment, I always wanted a planter with grass, so I could say I had a yard. I even shopped for miniature lawn ornaments, benches and things to dress it up. If you're going to order plants for it, order them now but ask to have them shipped when it is safe to do so. Then they will show up and you will have to take time from your busy life to set up that terrarium. Otherwise, I bet if you asked around you could find a local place with suitable plants. If you don't want to risk shipping tropical plants (they'd probably be fine, though) you could get busy with soil and rocks and moss to create a little landscape, all ready for the plants once you get them. Once there is a place for them I know you, obsessive gardener that you are, won't be able to resist buying them and planting them up. Also: Go to www.glasshouseworks.com -- their website is crazy disorganized, but their plants are AMAZING. You won't be able to resist. I can't wait to see what you decide to plant in your procrastinators terrarium. Sometimes procrastinating is a good thing because it lets you ponder what you REALLY want to do. That's the positive side I see, anyways. I think Kathy has the right idea...you will plant it if the plants show up! 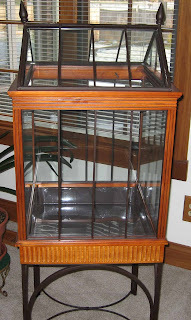 In the mean time you can get that lovely terrarium/Wardian case set up to receive them. I can't bring myself to suggest silk plants, nope, just can't do it. What you might do with it for now is fill it with holiday decorations, a set of battery powered lights, some colorful ornaments, some pinecones, maybe a fairy or two. It seems a shame to leave it empty. It is a Gorgeous terrarium;-) Standing alone, it looks amazing! Filled with green stuff (ie: living, breathing plants!) it'll be out of this world amazing! I'll be interested to see what you (eventually) decide to put in it! I love the concept of the Accidental Terrarium. Sometimes the accidental gardens turn out to be the nicest, I think. But the Procrastinator's Terrarium seems to be made just for me! Maybe you could pour your growing compost into your procrastinator's terrarium? Just kidding. Any florist will have an abundance of small house plants that you could put into your big terrarium, also the suggestion of checking out the big box stores is a good one. When I lived in Alaska the only way I could have houseplants was in a terrarium, and I found that the birds nest fern was a natural for that sort of environment. also, Peperomia and maidnehair ferns like a nice low light level. Good luck, Carol. I know all about procrastination, I'm a master at it. Now I must stop procrastinating and get out there and finish cleaning all the dead hosta leaves out of the Hosta Dell. That is pretty much how terrariums came into being. A scientist named Ward spotted a tiny fern growing in a jar he was using for some entirely different purpose. He named the invention after himself, of course. Wardian boxes became the way bring plants from their tropical homelands on ships. The boxes protected them from the wind and kept up the humiditiy they needed. Anonymous beat me to it. Doctor Nathaniel Ward was a fern junkie, as was just about everyone in London in the early 1800s, but keeping ferns alive in London during the early days of the Industrial Revolution was nearly impossible. Being interested in any number of aspects of natural history, he came across the pupa of a sphynx moth, and brought it home to put it into a jar. He included soil to keep the pupa covered, but completely forgot about it when he spotted a fern sprouting in it. After conducting experiments with the fern, which seemed to do perfectly well in London conditions so long as it was protected from coal smoke and the like, he worked on larger cases. The issue with transporting plants by sea at the time wasn't just due to wind, but protection from saltwater sprays and making sure that someone watered them properly. (Take a look at the efforts spent on transporting breadfruit to Haiti via the HMS Bounty, and you'll understand why Captain Bligh's crew mutinied.) Wardian cases were a very low-maintenance method of moving plants while guaranteeing that they still got enough light. In fact, they were so successful that people started buying them for raising ferns and other plants in indoor spaces, and that marks the beginning of terrariums as we know them today. As far as things to go in that big Wardian case, with some light augmentation from orchid lamps and the like, you might continue with the Victorian theme and raise some easy Nepenthes pitcher plants inside, considering the size. Go say hello to Jacob and Jeff at Sarracenia Northwest (http://www.cobraplant.com), and they'll set you right up. I suggest a drive south. Get in that car, drive to Florida, buy those plants, and bring them back with you. Bring them into the hotel overnight so they don't freeze. That'll take care of that old terrarium! It really is a pretty one. I have a cool piece of glassware that I, um, liberated from an unused bio lab at school. I plan to turn it into a terrarium but I've never done it before so it's been sitting empty for at least two years now. I'd be happy to fill it with whatever I find at local stores. I'm just oddly reluctant to start :/ Plant yours and motivate me!! I jus wanted to come back by and thank you for participating in Operation Christmas Child. We raised $800 and made 20 boxes for the little kids. Why do you have to ship plants? Just find a good place that's near enough to drive. I am so not buying your reasons for not planting that gorgeous terrarium. Hmmm. Well, knowing you, you'll get it planted and it will be great.